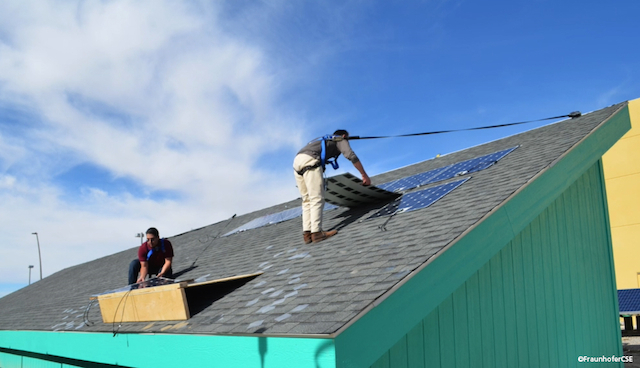 One of the bigger elements, in terms of both time and costs, to installing a home solar power system (other than the cost of the solar panels themselves), is the installation of the solar array. To properly support and distribute the weight of the solar panels, a racking/mounting system has to be installed on the roof first, which is a minor construction project in itself, and then the solar panels can be mounted to the racking and connected together. Between the two, it adds up to quite a bit in labor costs, as well as added weight on the roof, and it also requires getting a permit (which also adds to the time and costs). But when the innovative plug-n-play solar technologies being developed by Fraunhofer CSE eventually make it to market, which could be as soon as five years from now, ‘stick-on’ solar modules might end up being the truly affordable solar option. The Fraunhofer Plug and Play PV system uses slim and lightweight solar modules, almost like solar shingles, which attach directly to the surface of the roof itself, and which could be purchased as a pre-configured system and installed by the homeowner or handyman. The solar panels are connected together through a simple interface on each one, and then to an inverter, which converts the DC electricity produced by the panels into AC for connecting to the home and grid. According to this piece in TreeHugger, a simple connection from the solar system to the meter (which has to be done by an electrician) is then all that’s required (other than a sunny day) to be up and generating solar power. In addition to being easy to self-install (said to take just 10 hours, from start to finish), this home solar system is designed to be virtually dummy-proof for installation and operation, and includes a self-test feature to ensure the correct installation of all the component. The system also has the built-in ability to communicate with the local utility and send data, which is designed to help automate the permitting, inspection, and interconnection processes. The Fraunhofer Plug and Play PV system is being developed as part of the US Department of Energy’s SunShot Initiative, with the five-year goal being to create an affordable solar power system (costing less than $1.50 per watt installed), which is also simple enough for the average person to install on their home’s roof. Join the rooftop solar revolution today!